Washington (CNN) – As the U.S. military campaign in Libya approaches the 60-day mark this Friday, six Republican senators wrote President Obama asking if he will comply with the War Powers Act, which says Congress must authorize action that lasts more than 60 days. "Friday is the final day of the statutory sixty-day period for you to terminate the use of the United States Armed Forces in Libya under the War Powers Resolution. Last week some in your Administration indicated use of the United States Armed Forces will continue indefinitely, while others said you would act in a manner consistent with the War Powers Resolution. Therefore, we are writing to ask whether you intend to comply with the requirements of the War Powers Resolution. We await your response," wrote the GOP senators Wednesday. The letter was signed by Sen. Rand Paul, R-Kentucky, Sen. John Cornyn, R-Texas, Sen. Tom Coburn, R-Oklahoma, Sen. Jim DeMint, R-South Carolina, Sen. Ron Johnson, R-Wisconsin, and Sen. Mike Lee, R-Utah. The GOP senators said they believe the president already violated part of the War Powers Act – which says the president's constitutional powers allow him to only deploy troops into "hostilities" with a declaration of war, specific authorization from Congress or a national emergency caused by an attack on the U.S. But the president did follow the provision in the 1973 law requiring him to provide information to Congress about committing U.S. forces. Now the question is whether he will abide by the part of the War Powers Act which says he must get Congressional permission within 60 days. Sen. John Kerry, D-Massachusetts, the chairman of the Senate Foreign Relations Committee, said on Tuesday that he is "talking to the administration" about what exactly Congress and the White House might do to abide by that looming 60-day deadline Friday with regard to Libya. "We want to make sure we're not stretching anything inappropriate. So we're looking at some language," Kerry said as he entered a weekly policy lunch in the Capitol with Democratic senators. "We're really looking at it very seriously to keep everyone on the same page." Sen. John McCain, R-Arizona, a vocal advocate of U.S. military support for the Libyan rebels, has been in talks for weeks with Democrats and Republicans about a resolution backing the Libya mission – but perhaps something short of voting on a War Powers resolution. He said Tuesday that congressional leadership has not shown an "inclination" to vote on something. McCain said he doesn't believe the War Powers Act is constitutional and therefore he doesn't believe the president needs congressional authorization to continue the mission. "I've never recognized the constitutionality of the War Powers Act, nor has any president, either Republican or Democrat," McCain said. But Sen. Rand Paul told CNN congress should not let any president get away with launching military action without congressional approval, and that he and his colleagues may go to the Supreme Court and ask for a ruling on whether the president is in violation of the law. "There is a law. It's on the books, and in plain reading of the War Powers Act, he appears to be in violation of the War Powers Act," said Paul. Paul said they will also attempt to push "legislative remedies" on the Senate floor, but acknowledges that may be hard to accomplish since Democrats control the schedule. "To me it's the most important debate we'll ever have up here. If we're going to send someone, your son or my son to war, its important that it be done properly, and its important that if there are constitutional restraints, we obey them," said Paul. Put it to a vote. What's the problem? If the Congress votes to stay out of Libya then we will be inviolation of treaties and commitments that we have with NATO and other countries. Put it to a vote, now. Why wait? Notice how the Congress has the ball, not the President. The Congress must approve the action, and if Congress does not act who is in violation of the law; certainly not the President. He fulfilled his end. The point of the letter, was what?
" Therefore, we are writing to ask whether you intend to comply with the requirements of the War Powers Resolution. " Fascinating that Republicans are now concerned about the human cost of "war" - and please, let's acknowledge that we are not involved in a "war" with Libya. A "war" requires LOTS of ground troops and support vehicles. The US has NO ground forces or support in Libya; we're simply flying a few airplanes over the country, at times dropping bombs or firing missiles. Contrast the GOP's current response - no doubt ENTIRELY the result of having a Democratic President - with their "bring it on" attitude in Iraq 8 years ago. Where were these people when Bush LIED about the reason to attack Iraq and BORROW TRILLIONS from China to do it???? Oh – they've met a deadline they can nag on, while they postpone every other decision they're supposed to make. Get rid of this idiot. In fact, Kentucky needs TWO new senators. If this is the face of the tea party, we've nothing to fear except those who chose not to vote next election. I am a Democrat, and I absolutely agree that this needs to go before Congress. This is not a case of Republicans trying to hamstring Obama. I am REALLY, REALLY tired of Presidents sending troops to fight on foreign soil, just because it seems like a good idea to them. The War Powers Act was a created mostly as a reaction to Viet Nam, but also other long-term but undeclared wars such as in Korea. One standard is good; two's better? Oh, so after two failed wars in the Middle East, NOW the Republicans want to complain about the use of military force by the President? SERIOUSLY? Does the GOP hypocrisy know no bounds? More politics. These 6 senators are sworn obstructionists to anything the president does. They have zero credibility and are an embarrassment to the U.S. Senate. 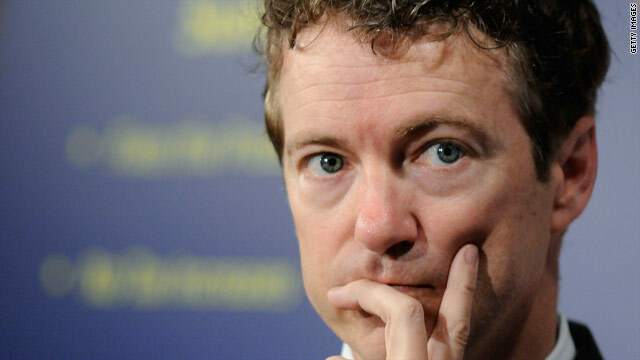 Rand Paul wouldn't know a war if it jumped up and slapped him in the face. What a joke! Yet another double standard by Democrats. Democrats would be all over a Republican president calling Republicans warmongers and worse. However, once again they show their true colors and overwhelmingly ignore their own record on the issues.